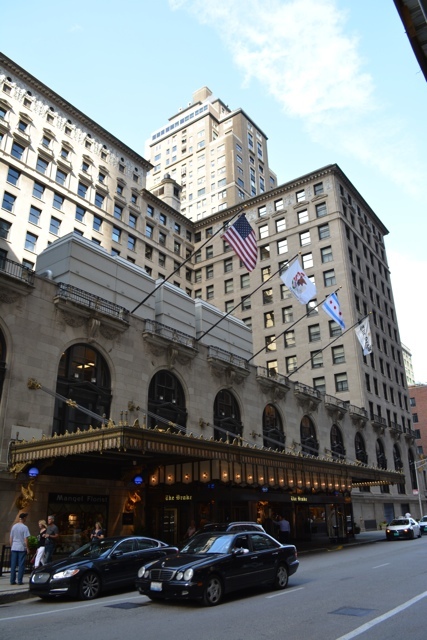 The city of Chicago may not be the most British or most Royal of all places, however it is home to some extremely fancy and beautiful hotels that are full of all sorts of old world charm. The Drake Hotel specifically which dates back to 1920 is not only known for it’s history, design, and stunning rooms but also for its delicious afternoon teas served in the elegant secluded lobby the Palm Court. 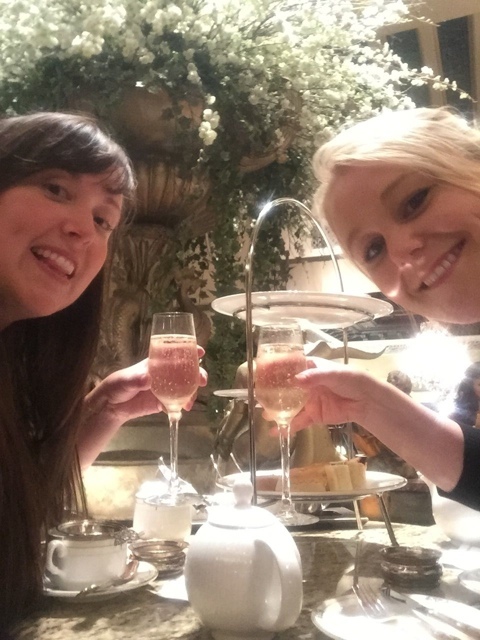 While visiting this summer I had the chance to enjoy a DELICIOUS afternoon tea at the Drake Hotel in Chicago (a city that has quickly become one of my favourites) with my good friend Lauren. 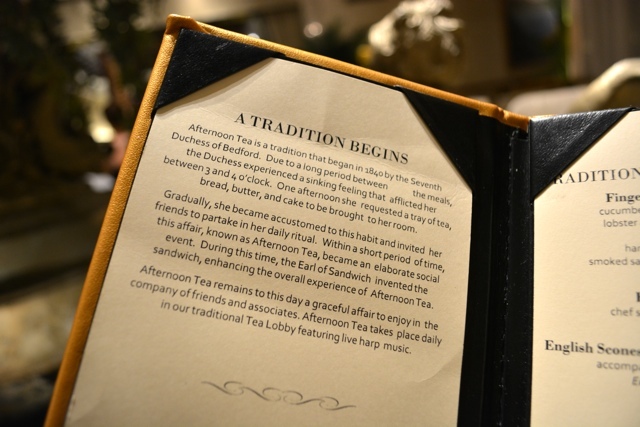 The very same tea that the Empress of Japan, Princess Diana and Queen Elizabeth herself have also enjoyed… Well maybe not the exact same tea… I imagine theres was a million times fancier, but afternoon tea in the same building and room as they also enjoyed it nonetheless. 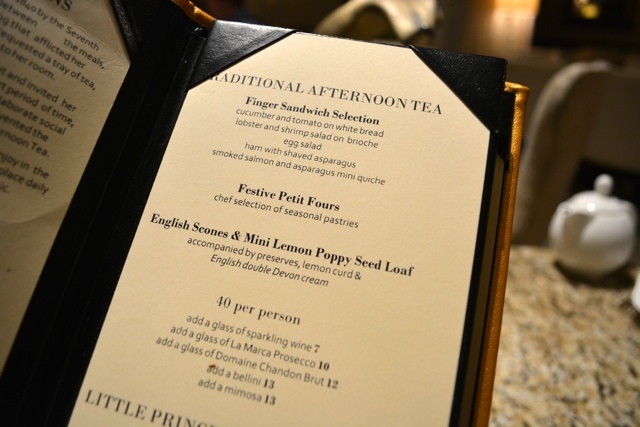 Previously ranked as one of the best afternoon teas in the US by USA Today I was thrilled to have the opportunity to experience it for myself. 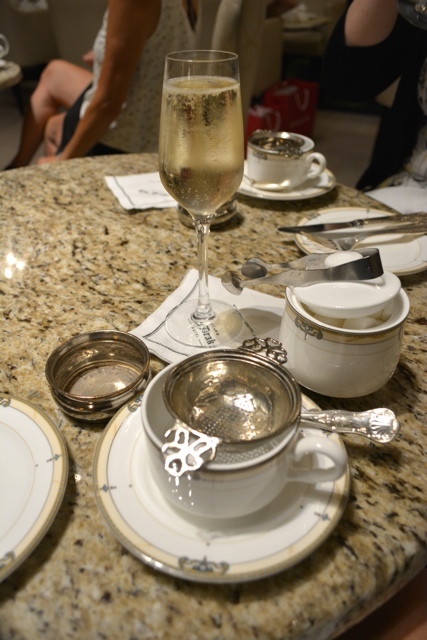 Without a doubt this was also one of the fanciest teas that I have ever been to. We were sat by a gorgeous fountain and we had a harpist providing that afternoons entertainment. You don’t see professional harpists just anywhere. We started our tea with a lovely glass of bubbly while we perused the menu and extensive tea and fancy tea-tini cocktail list. Two full pages of tea options. 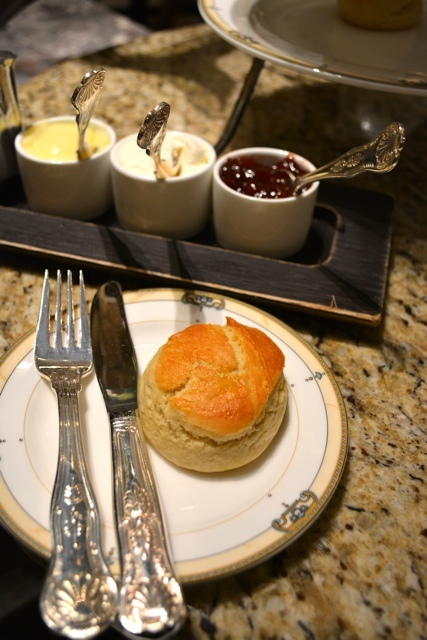 The history of afternoon tea! 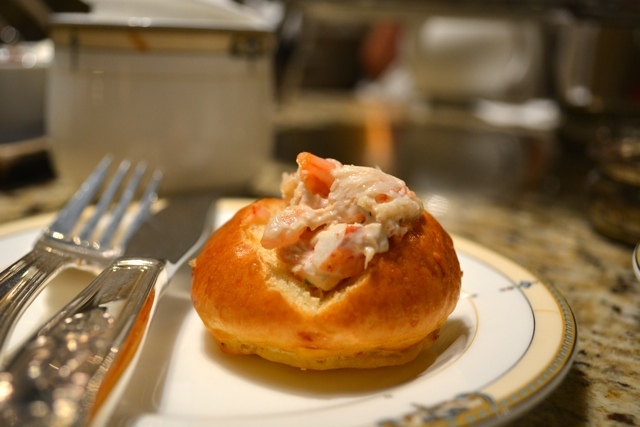 We started as you do at most traditional afternoon teas with scones, then sandwiches, savoury items and desserts. Everything was delicious, however I wish that there had been some chocolate options in the dessert selection. Fresh scones, jam, clotted cream and a lemon custard. Festive petite fours and lemon poppyseed bread. Our afternoon tea lasted the better part of two hours if not longer as we dined and drank and even had more hot water added to our tea when we ran out. 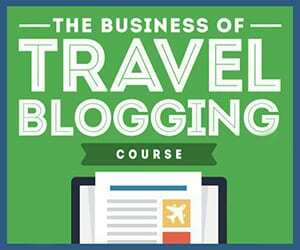 If you are planning on going yourself make sure you make a reservation in advance. Everything about our experience was elegant and lovely. 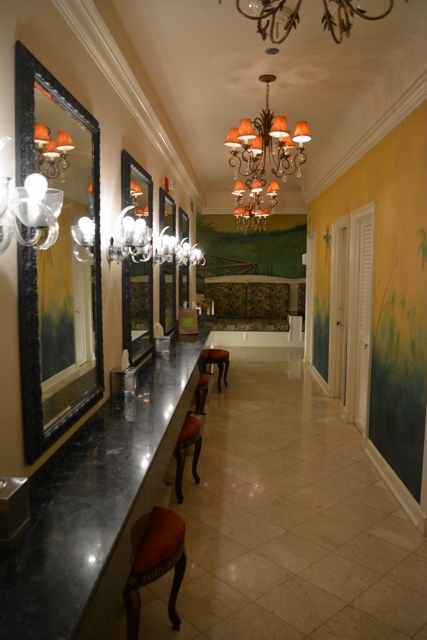 Even the Ladies room at the Palm Court in the Drake Hotel was once voted one of the top ten bathrooms in all of America. If you find yourself in Chicago sometime soon, I highly recommend a visit for yourself. 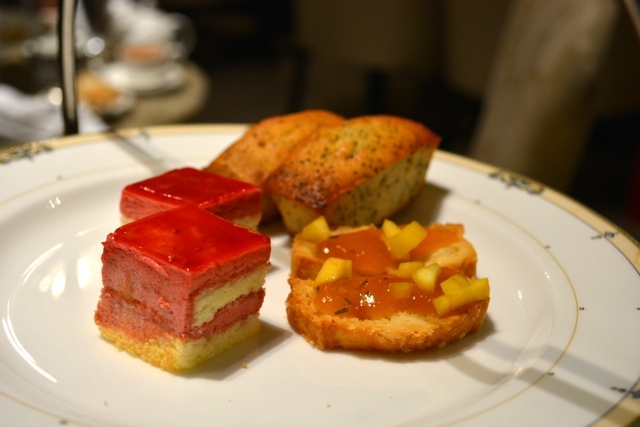 If you really enjoy your afternoon tea experience at the Palm Court you can also take a piece of it home. 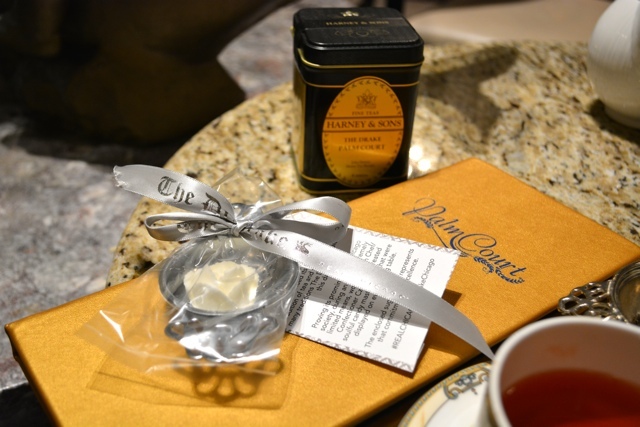 There are several items available for purchase including a classic tea strainer with sugar rose and even their own brand of tea made for the hotel by Harney & Sons. 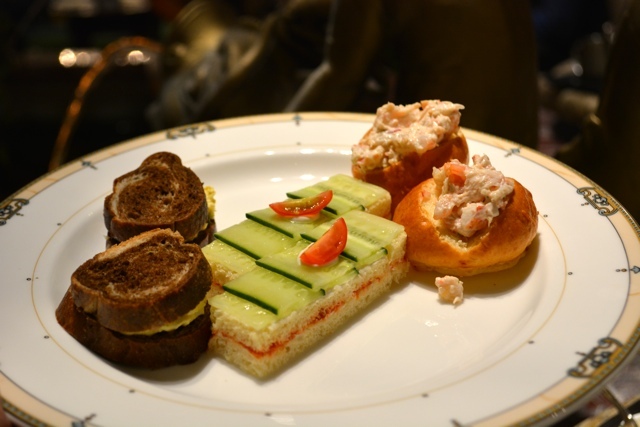 Afternoon tea is served in the Palm Court daily from 1pm to 5pm. 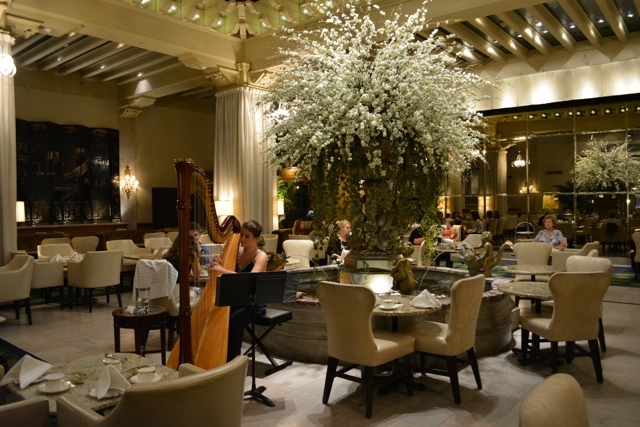 The harpist entertains at various times from Wednesday to Sunday and the dress code is smart casual. 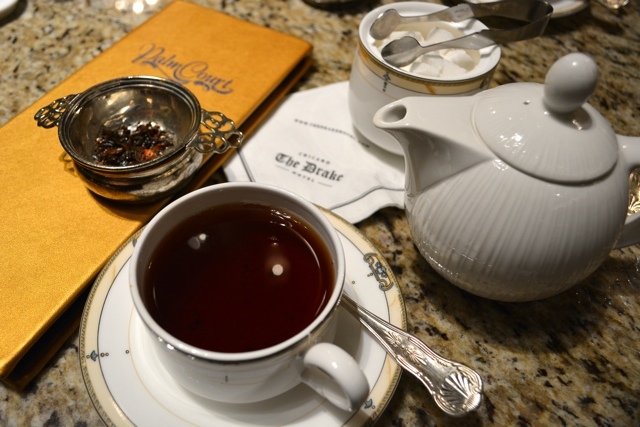 If you find yourself in the Chicago area often and you love tea as much as I do, you should also look into signing up for the Palm Court Tea Club. Member benefits include a tea gift set, the Palm Court’s own blend of tea, a complimentary afternoon tea on your birthday, first choice for holiday reservations, a complimentary tea after every 8 visits and more. 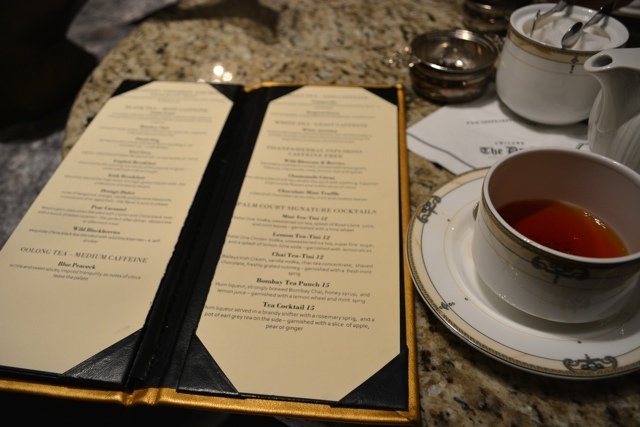 Special thanks to the Drake Hotel for hosting my tea, as always all opinions and delightfully full stomachs are my own. This tea looks wonderful, Cailin. However, you lost me at no chocolate for dessert! Maybe they have chocolate other times? That might be a deal breaker for me. I have always wanted to go to Afternoon Tea and I must say, these photos make me want to go even more! It all looks so fancy and delicious, I’m glad you enjoyed it!